It is important for the company to build strong relationships with the customers. 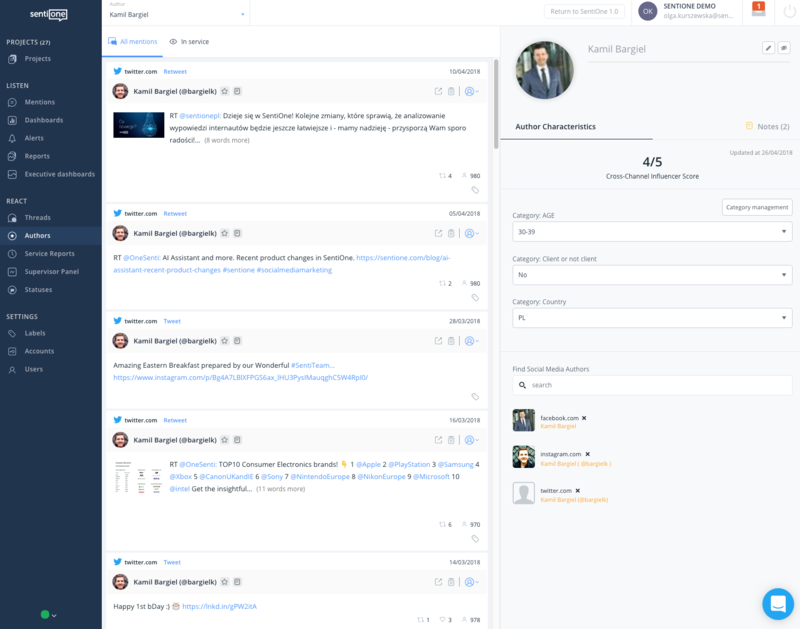 In SentiOne, you can create your own base of conversation authors, most active users on your social channels, possible sales leads, and all the authors of mentions being served as a thread in SentiOne React module, to make sure your team is up-to-date with the conversation history and status. - See all mentions published by the author on your channels. Usually, people have profiles on many social channels. This is why we provide a functionality to create a cross-channel author view. It works very simply - you can add a specific author to your internal database with just one click. - See all mentions from threads which are currently in service. - Add notes to author’s profile. - Add more advanced characteristics - fill in user categories (characteristics that can be set up and customise per company). - Check the Cross-channel Influencer Score (our algorithm calculates how popular the author is on different social media; scale: 1-5*; 1 - not that popular, 5 - very popular). * the score rises when the author is active (publishes a lot of mentions), when they receive a lot of reactions (likes, comments, etc.) and when they own a lot of accounts on different social media sources (you need to check all of them manually). - Integrate other social accounts for the same user to track their activity on all social channels at one place. How to create author’s categories? Open “Category management” tab - this is where you can manage your categories, and add subcategories for categories already created. Click “Create” in order to create a new category.